Leasing Available from $12.90 per month! 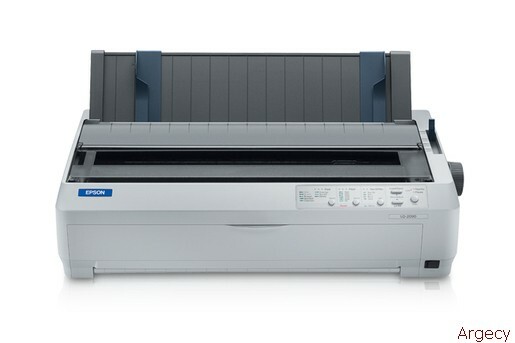 With powerful 24-pin technology, the wide-format Epson LQ-2090 delivers precision text and graphics, plus rugged reliability for critical print requirements. Offering print speeds of up to 529 cps and easy integration with existing printing formats, this robust performer is sure to increase productivity. With versatile 5-part forms printing, multiple paper loading options, and a durable, long-lasting ribbon, it races through reports, purchase orders, invoices and more. Ideal for point-of-sale, manufacturing, and production environments, this workhorse boasts an amazing 20,000 POH MTBF rating and a 400 million character print head life. Its easy-to-use control panel makes changing print settings a snap, while convenient configuration software facilitates simple setup via a PC. It even provides Parallel and USB connections, plus a slot for optional interface cards, including high-speed Ethernet, for greater compatibility with practically any system. And, with both Epson and IBM& printer languages, it's a great replacement for the Okidata ML-391/491 or the Epson LQ-2080. Ideal for businesses that require high quality, multi-part forms printing, the reliable Epson LQ-2090 printer offers extremely low operational costs compared to other printing technologies, as well as superior performance in comparison to other printers in its class. Designed for use in demanding print environments, this heavy-duty dot matrix printer handles critical business applications with precision and ease. And, it's backed by a three-year warranty that includes Epson's superior service and support. Epson does not accept returns on refurbished items except if product arrives defective, in which case, we will provide a replacement with the same model or equivalent. This unit may not include the same software or paper pack as new models. Bidirectional logic seeking for text and graphics printing. Continuous multipart, original plus 4 carbonless copies, maximum thickness .018"
Single sheets - 3.9" to 16.5"
Continuous - 4.0" to 16.0"
Cut-sheet feeder - 7.2" to 16.5"
Single sheets - 3.9" to 14.3"
Continuous - 4.0" to 22.0"
Cut-sheet feeder - 10.1" to 14.0"
Height 6.3" x Width 23.2" x Depth 13.8"